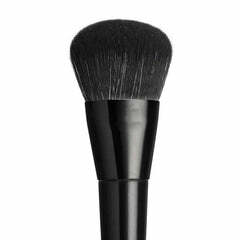 This professional angled brush applies foundation like a dream. The elegantly soft vegan bristles lets you glide product smoothly over the face for a luxurious, even complexion. Also, its angled edge helps you navigate the product over your facial contours to make the perfect base. Ideal for the most devoted makeup junkie, this brush will help enhance your complexion for reliable and professional results. 20.7cm full length. Bristles - 3.1cm high, and 2.2cm wide.